What is there about a line up that attracts attention. Is it the belief that people only line up for something good or to see something really bad? Are lineups simply a way to avoid decision making and go with what others have already decided is worthwhile? To me lineups are a signal to avoid something but I am alone. Today was different. I had to find out for what made a group of expats gather. It was Love for Sale. The SPA was selling Puppy Love and Cat Disdain. It was Rescue Day in the Jardin. Expats are lonely. They have left their own country and moved to another country. They have built lie up lie to make themselves more interesting and yet deep down they want to be loved. No wonder they line up to touch a small animal. You don’t have to impress a dog and cats could care less for you. For a moment, today lonely expats felt connected and could gush to each other about this or that animal could sense in them. Poor little dogs and cats. I wonder if they know what is about to befall them. Some needy expat is going to adopt them and focus all their love on them and parade them about as Little Rescued Souls when all the animal wants to do is sniff another dog or sleep in the sun. Who is really being rescued here? 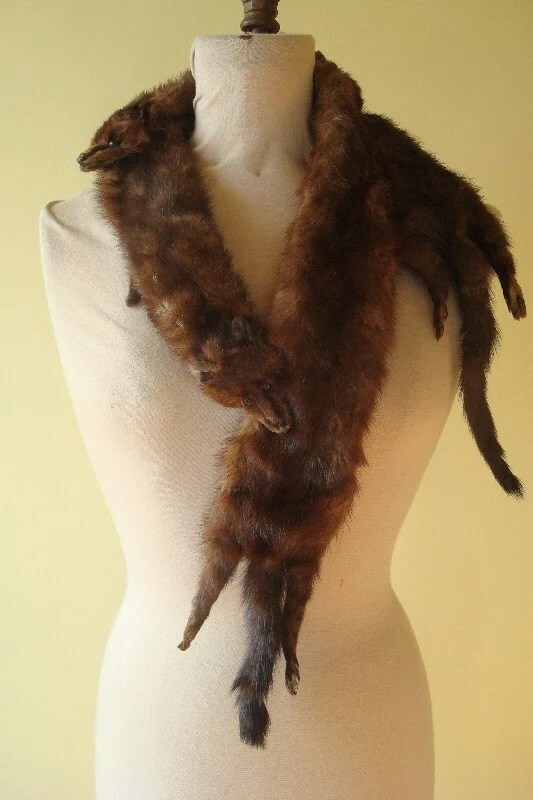 My grandmother wore one of these full fox pelt wraps. Imagine the effect that looking up at your grandmother and seeing a fox around her neck would have on an imaginative young child. You were not sure if the fox, and I do believe it was foxes, were dead or not and that at any minute you would watch your grandmother die at the mouths and claws of these currently stilled creatures. You would look away but then look back because you didn’t want to miss any of the struggle you knew your grandmother was about to face. What kind of grandmother and I know mine was not alone, would deliberately wear fur in front of an impressionable child. I do believe that PETA was formed by individuals who grandmother’s owned full fox pelt wraps. 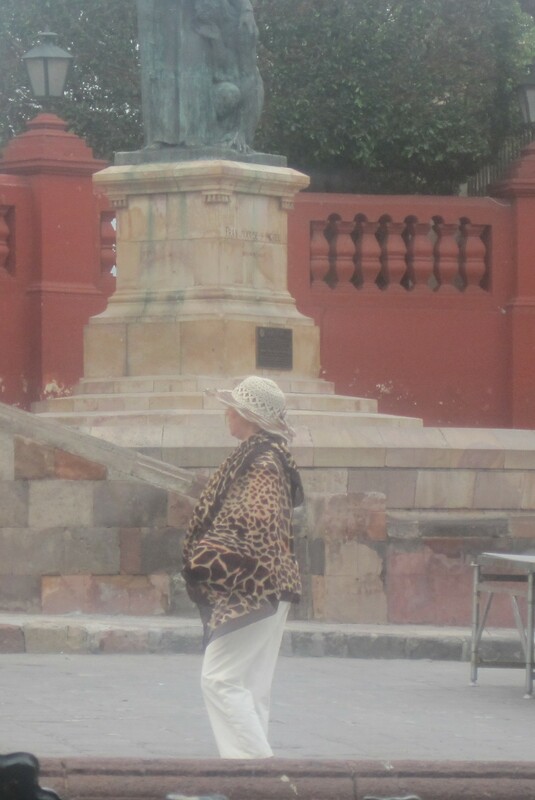 You can imagine my terror in San Miguel when this woman walked by. All those feelings about my grandmother and her death by tiny foxes surfaced again. 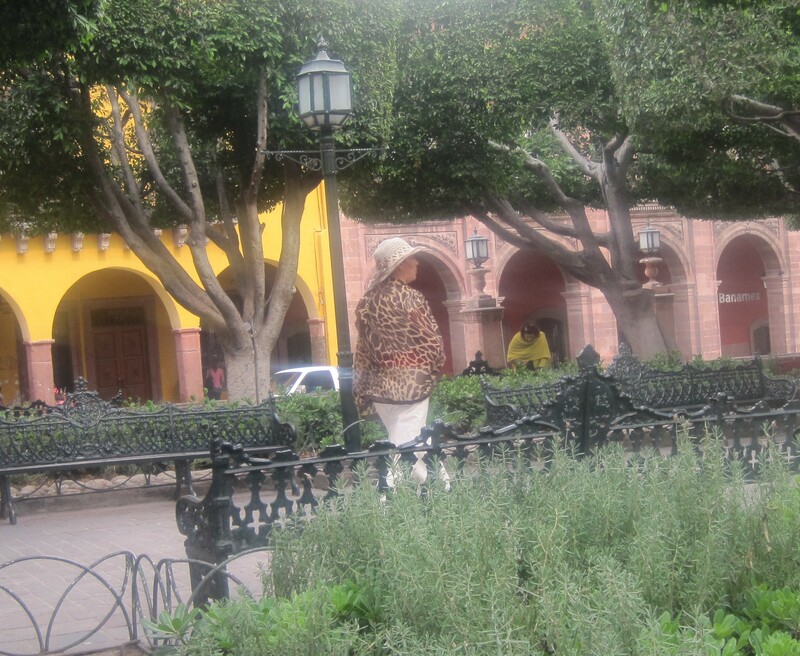 I was prepared to see the leopard come alive and eat this poor woman right in front of me in the Jardin. I tried to look away but could not. It was going to be Siegfried and Roy all over again. I didn’t happen that day. There are times when the Magic of San Miguel hits you in the face or in this case the eye. Into the Jardin today, came this little dressed creature. It was not on its own. It was being led. The owner is I think one of the most fascinating women in San Miguel. Her outfit was over the top and in such a good way. She dressed her dog to match. I could not take my eyes off this scene. There is something truly magical about someone who fully embraced magic with no pretence. 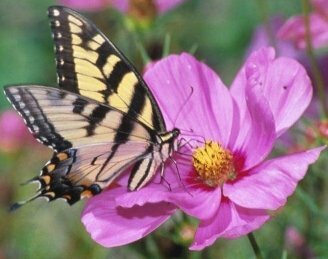 I looked around, thought of my life in Toronto and at that moment a flat-bed truck from the Circus came around the corner with a tiger and a camel in a cage on the flat-bed. This is like a Fellini movie. I want to live in a Fellini movie and not in some suburban, all neat and tidy life. I love Mad Men because it shows the darkness that existed in that nice and tidy life I grew up in the 1950’s and 1960’s. 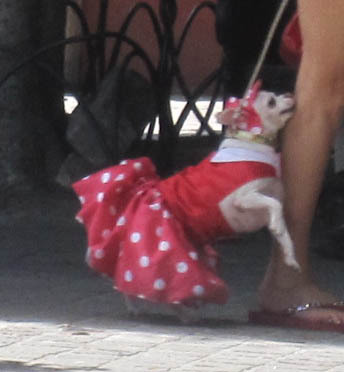 This little dressed creature is what make life in San Miguel interesting and when I went on Facebook today, here this woman was suggested as a friend. More Magic? What is cuter than dressing your little pooch in a visor? Sun does get in their sensitive eyes and these visors protect them. And when you play poker, having these little poker whizzes on your lap simply adds to the fun of the game. Imitation is supposedly the sincerest form of flattery but in San Miguel imitation is simply the search for uniqueness. Gangs takes inspiration from so many things – flowers, childhood tales, household items. This new gang instead of dressing dogs to look like them, dress themselves to look like their dogs. Out with the Straw Hat and in with the Visor. Helen has chosen the Poodle Visor for shopping. Rose takes her inspiration from the Balloon Vendor and her dog Balloon. If you talk to anyone in a visor then remember to ask about the welfare of their dog. Well you won’t really have to ask as the dog will be yapped at their feet trying to escape and get rid of that terrible visor their owner has made them wear. 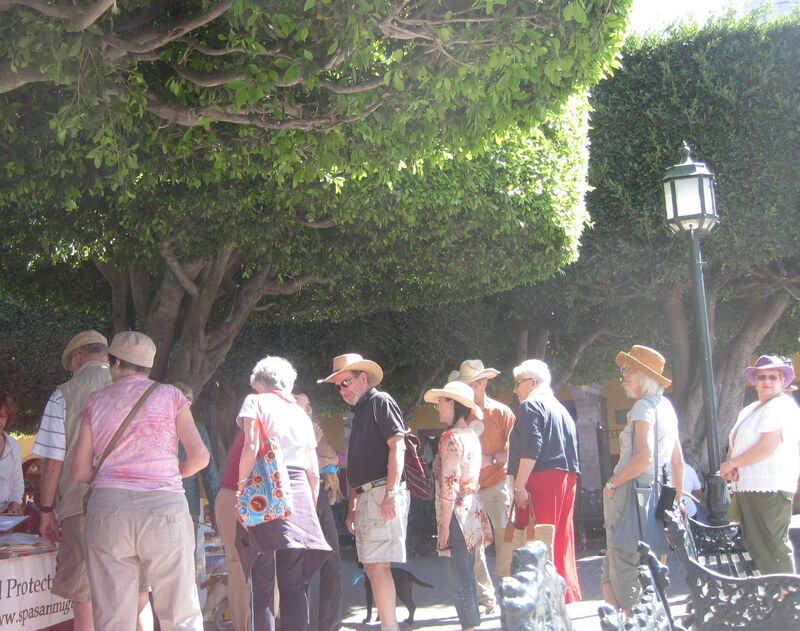 They say that women outnumber men in San Miguel by a ratio of 6 to 1. The standard joke is that most males in San Miguel are either married, going home on Tuesday or gay. The married ones are usually easy to spot with a wedding band and you never see those going home on Tuesday again but the gay ones pose a problem to the Cougars of the Jardin. To the male deprived women of San Miguel, it often never occurs to many of them, that the man in their viewfinder might be gay. One of the great sports in the Jardin is to watch a Cougar target a gay man. She almost shakes in anticipation of fresh meat – a new soulmate. She circles her pray and then zeroes in for the kill. Plastic surgery has already made her eyes wide open but she uses whatever muscle is left to flirt and engage. She begins the dance and all eyes focus on her, waiting for that moment when the shoe drops and she realizes he isn’t married nor going home on Tuesday but Category Three . At that moment she knows the humiliation, she now faces, by all those who knew what she didn’t know. She is now, the Laughing Stock of the Jardin. At the core of this humiliation is the failure to understanding the male spectrum of sexuality and a bit of homophobia. For the Cougar, Gay Men look like Male 1 and Straight Men look like Male 2. The Cougar lacks Gaydar – the intuitive ability to assess someone’s sexual orientation. To be honest, this is complicated by the phenomena of the metrosexual – a heterosexual with a strong concern for their appearance, and/or a lifestyle that displays attributes stereotypically related to gay men. He might seem gay but be straight or he might seem straight but be gay. It is this dilemma puts the Cougar at risk of humiliation. If you were Cougar which group would you hunt? It is not easy being a Cougar. It is a minefield of humiliation and wasted time. The post on the Betty Complex Gang identifies some of the difficulty distinguishing between that Gang, The Lesbian Gang and Men Who Look like Old Lesbians Gang. One easy way is to ask about birds or say “Aren’t men idiots”. If their eyes light up you got the Betty Complex Gang. But the Gay Gang is tricky. Or too much jewelry will give it away but again it could be a metrosexual. This one is a real test of gaydar. Wedding band and hand on hip. Just a minute, this is not really a test, as each says unavailable and probably Canadian. Life is so difficult for a Cougar. Okay an easy one, is the word Faaaaabbbuuulous. Only gay men and women in the Classic Gang use that word with all the extra vowels and consonants or if the sibilant s. If you hear an S in banana you can be pretty sure that the guy is gay. But that is the easy stuff. There really is no easy way for Cougar to avoid humiliation and on some level the hunting instinct goes deep. 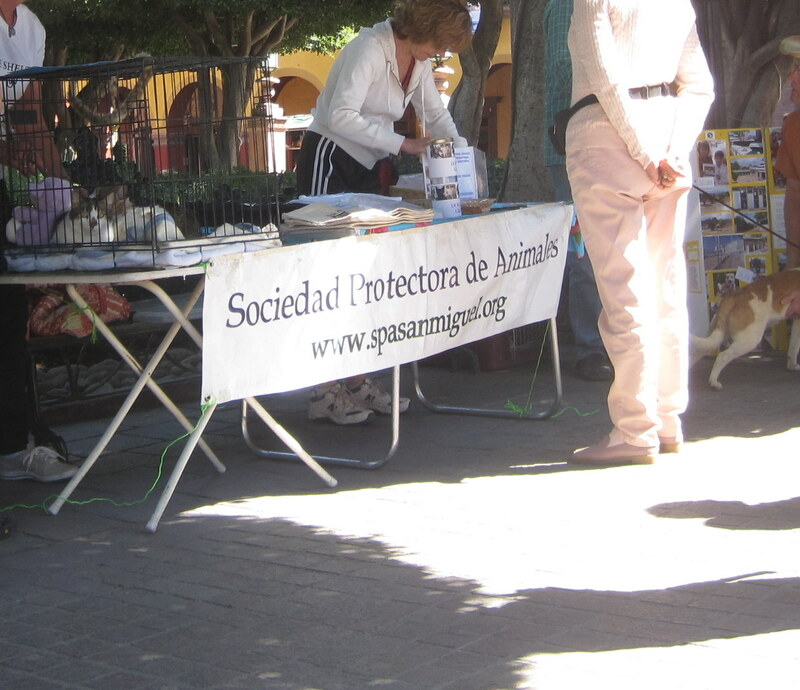 One of the top searches on the Web that points to this blog is Gay Bars in San Miguel. San Miguel does have a large gay population but it is completely integrated into San Miguel because there are so many liberals in San Miguel. There is no real Gay subculture in San Miguel, well there is late night cruising in the Jardin. As a result there are no gay bars nor the need for one. If a person has to identify who is gay and who is not in San Miguel, then they don’t really belong in San Miguel unless the purpose of the identification is to cross them off the list of eligible men.